Why travel all the way to Costa Rica and settle for anything less than Marlin del Rey when wanting to enjoy the Pacific Ocean? $85 per person includes Snorkeling, Sailing, a meal with BBQ Chicken, Guacamole, Salsa, Various Chips, Various Fruits and Homemade Chocolate Chip Cookies, Open Bar with Premium Liquors, imported and domestic beers on the nicest Catamarans in Guanacaste, Costa Rica. 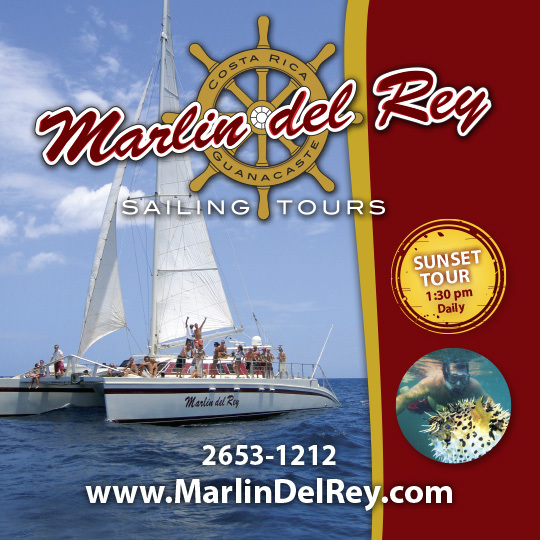 Visit their website at www.MarlinDelRey.com or call 2653-1212 to make a reservation. FREE TRANSPORTATION FROM MOST HOTELS. GO WITH THE BIG CATS! Go with Marlin del Rey. Older PostFISHING ADVENTURES $50 per person!